Thanks so much for the info on how to do it, so chuffed I even went back and put Poppydoodles picture up. I take it this was to do with your signature photo and the Piti wotsit line? Well done, they are there. Can someone explain the logic behind the PitaPata ticker... it seems to show that Poppy is 6 years old, and Fozzie's doesn't seem to match up either? I know some peoples just show months rather than how many years old their dood is... Or am I missing something (...like a brain cell or two!! )? But I have to admit i don't really like the way they advance along the pitapata as they age, it seems like it's measuring their life. Fozzie is showing his age correctly as in 2 yrs, 4 months....... But showing him at nearly the middle of his line is a little disconcerting and hopefully way way short of his lifespan. The only issue I have with the thing though is that it automatically updates, so if you were to look back at this post in two years time, Fozzie would be shown as over four. Same as the signature picture. 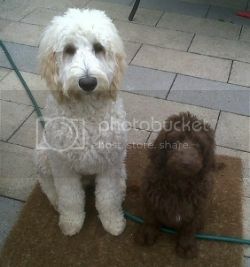 If I ever get round to putting a new picture up showing that Florence is a teensy bit taller than Fozzie, that is the photo that would appear in all my posts, not the one that appeared when I actually posted. They only progress through the months - on their birthday they will start again at the beginning. Thanks Harvey Doodle! I wondered if that was the case.... I must admit I've never posted one as, like Liz!, I didn't feel comfortable watching him progress along the years - but months is much better. It is a little odd, Sue, when you look back at old posts (for instance about puppies) and the ages of the doods are so different to what the poster is talking about! I quite like the way you can see if a dood is the same age as yours - but I don't think I'll be making a PitaPata for me! That would be rather terrifying! !